Treat cheat: Curb the holiday bloat with almond and coconut flours and protein powder in these delightful treats! These doughnuts, unlike those you might find in your local cafe, are made with plenty of chocolate protein powder. This gives them bonus muscle-building power without skimping on the rich chocolatey flavour of this familiar classic confectionery. Decorated with crushed candy cane pieces, they are an attractive addition to any festive feast. Pre-heat oven to 350°F. Take four After Eight candies and cut into small squares, set aside. Mix all dry ingredients together then add almond milk and mix until fully incorporated. Fold in After Eight squares. Pour the mixture into pre-sprayed doughnut trays. The mixture should be a thick consistency, so don’t worry if it doesn’t pour out like a batter. Bake for 15 to 18 minutes until doughnuts are cooked through. In saucepan or microwave, melt two squares of dark baker’s chocolate. 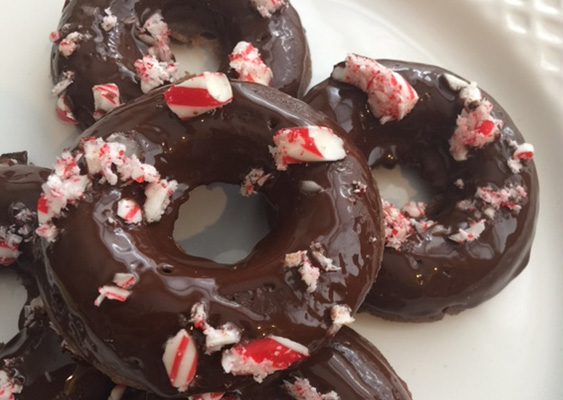 Dip each doughnut in the melted chocolate to coat. Sprinkle over with crushed candy cane for decoration for an added festive effect. A few years ago my life changed when I got into the fitness industry, I changed my diet from pizza and coffee to healthy, clean meals. However, I’m a Norwegian gal who loves her sweets and treats. I started playing around with different ways to create some of my favorites. This is how Mrs Cannon’s Baking was born! My new app, called Mrs Cannon’s Baking, is available now. You’ll find a full line of healthy meals for breakfast, lunch and dinner. You can have your cake and eat it too!